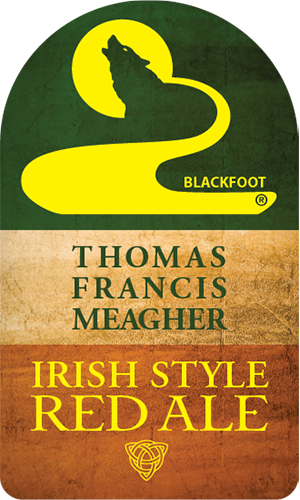 Blackfoot’s Irish-Style Red Ale is a clear and bright beer that is very balanced and smooth. We brewed it with wheat, Munich, and crystal malts to create a slightly malt forward, bready character. It was fermented at a lower temperature to provide a crisp clean finish. This year marks the 150th anniversary of Thomas Francis Meagher’s unexpected passing. We made this beer to celebrate his impressive life and fascinating accomplishments! It will also be on tap at the Meagher Fest on July 1st, 2017 at the Capitol.